Krassimira Stoyanova is one of the leading sopranos of our time, highly acclaimed by press and public alike. Krassimira Stoyanova was born in Bulgaria where she studied violin at the Conservatory and singing and violin at the Plovdiv Music Academy. Mrs. Stoyanova made her professional debut in 1995 at the Sofia National Opera House, where she could debut a wide range of roles. 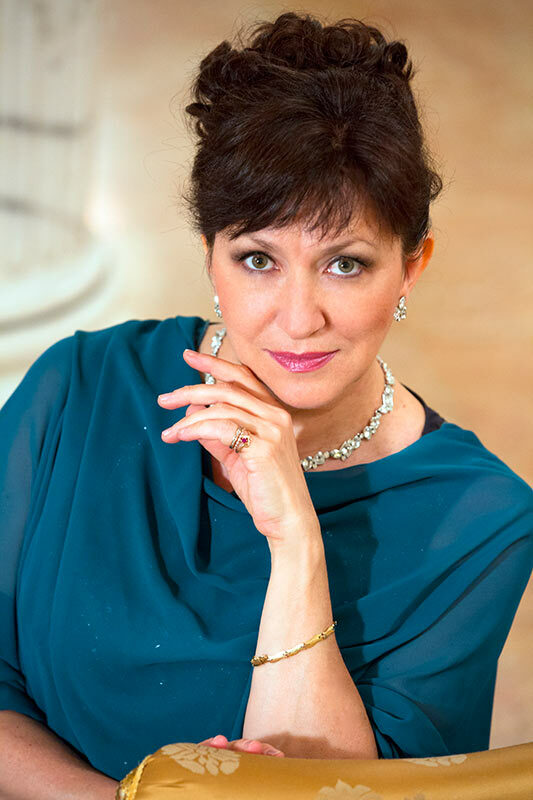 Since 1998 Krassimira Stoyanova has a close relationship with the Vienna State Opera where she has sung Rachel/ La Juive (new production with TV-production), Contessa/ Le nozze di Figaro, Micaela/ Carmen, Antonia/ Les contes d’Hoffmann, Liù/ Turandot, Nedda/ I Pagliacci, Mimi/ La Bohème, Violetta/ La Traviata, Alice/ Falstaff (new production), Rusalka (new production), Desdemona/ Otello (new production), Elisabetta/ Don Carlo (new production), Ariadne/ Ariadne auf Naxos (new production), Amelia/ Un Ballo in Maschera, Amelia/ Simone Boccanegra, Anna/ Anna Bolena, to mention only a few. From there her international career developed rapidly and since takes her to the worlds leading opera houses like the Metropolitan Opera, Royal Opera House Covent Garden London, Teatro alla Scala di Milano, the Bastille Paris, to the State Operas of Munich, Hamburg, Berlin, Dresden, Zürich. She performed at Romes Opera House, at the Liceu in Barcelona, at the Amsterdam Opera, in Bilbao, Teatro Colon Buenos Aires, at New Israeli Opera Tel Aviv. In 2003 the artist gave her debut at the Salzburg Festival where she is a regular guest since then. The artists works with the most renowned conductors like Daniel Barenboim, Riccardo Chailly, Myung-Whun Chung, Vladimir Fedoseyev, Daniele Gatti, Bernard Haitink, Manfred Honeck, Mariss Jansons, Fabio Luisi, James Levine, Zubin Mehta, Riccardo Muti, Seiji Ozawa, Georges Prêtre, Yuri Temirkanov, Christian Thielemann, Franz Welser-Möst. Krassimira Stoyanovas repertoire covers a wide variety of roles ranging from belcanto operas, the great Verdi and Puccini heroines as well as Richard Strauss to the Slavic repertoire. She dedicates herself also to less well-known titles such as I Guarani, Fosca, La battaglia di Legnano, Maria di Rohan, Les Huguenots, Dmitry, Die Liebe der Danae. She is one of the most sought-after singers on the concert stage. Highlights of her concert work are: with Beethovens 9th Symphony at the Ravenna Festival under the baton of Riccardo Muti, with Sir Colin Davis at the St Pauls Cathedral in London, with Mariss Jansons at the Vatican in Rome, with Christian Thielemann and the Munich Philharmonic Orchestra. Her concert repertory includes the Messa da Requiem by Verdi, Beethovens Missa Solemnis, Four last songs by R. Strauss, Dvoraks Requiem and Stabat Mater, to mention only a few. In 2009 Krassimira Stoyanova has been awarded with the title Kammersängerin der Wiener Staatsoper. During the current season 2016⁄17 the artist partecipates at Zürichs Opera House in a scenic production of the Messa da Requiem by Verdi, followed by a new production of Don Carlo at the Teatro alla Scala Milan, she returns to the Metropolitan Opera with Aida, to Londons Royal Opera House and Viennas State Opera with Don Carlo. On the concert stage: Messa da Requiem by Verdi at La Scala (Riccardo Chailly conducting) and at the Musikverein Vienna (Philipp Jordan conducting). She will sing solo recitals at Teatro alla Scala and at the Salzburg Festival where she also will appear in concerts of Lucrezia Borgia.